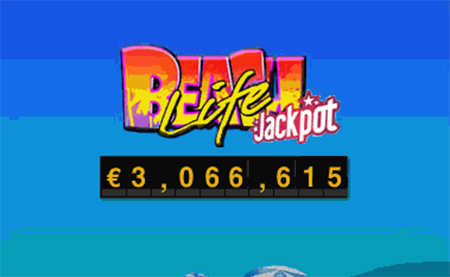 An incredible $3,066,615 has been one by one lucky person who hit the progressive jackpot playing Beach Life slots. Beach Life is a five reel slot game from Playtech which regularly has huge progressive jackpots up for grabs, it once pad out over $8 million! Unsurprisingly the game is built on a beach theme and features sand, surfers, ice creams, beach babes and sunshine on the reels. There’re also sea, sand palm trees, yachts and more in the background. One of the best features of Beach Life is that it is possible to win the jackpot with a bet as small as $0.25, for those who enjoy to wager a bit more the maximum bet is $5. The sunshine symbol is the wild and spinning five of them on the 20th payline will award the progressive jackpot, five on any other line will pay out 10,000 coins. There is also a sandcastle scatter symbol which will always pay out, two, three, four or five scatters pay 2x, 5x, 50x or 500x respectively. Finally, spinning three bonus chests on a payline will trigger the bonus game where the player must choose from 14 closed treasure chests each of which contains a different bonus amount. hoose three which each reveal a bonus amount which is credited to your account at the end of the round.